I’m still getting caught up on the last two weeks worth of comics — the Electric Mayhem’s official position is to frown upon reading of any sort — but I got way more books for the past 2 weeks than I have in many months. It was pricy, but a nice change of pace. Expect some reviews later in the week, especially Nemesis…That book was better than I expected, and yet Mark Millar still found a way to let me down. And here’s the noteworthy books of this week. BLACKEST NIGHT #8 (OF 8 ) – It’s finally here! I still haven’t gotten #7 yet, but I’m super-curious as to how this is going to shape the DCU for a while. Plus, it’s kind of nice that the madness is going to be over, for a while at least. 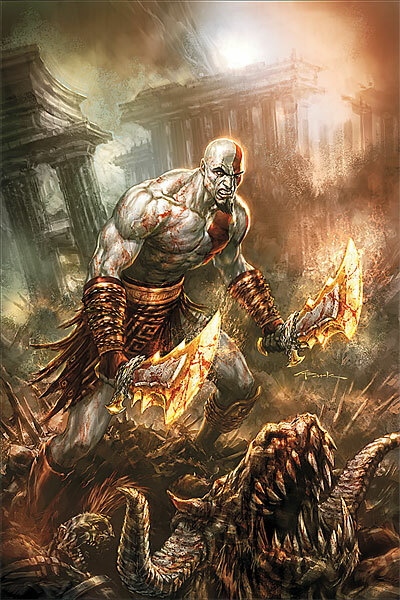 GOD OF WAR #1 (OF 6 ) – We don’t talk video games that much, but God of War was my favorite game ever (I’m currently playing the new HD GoW Collection and waiting for the price on GoW3 to drop) until Batman: Arkham Asylum came out. I don’t know much about this one, but Marv Wolfman will put out a solid story if nothing else, and the chance to see Kratos run around killing more famous figures from Greek mythology is one I’ll take. IMAGE FIRSTS YOUNGBLOOD #1 – I LOVE that Image is releasing issues of key books from their history for only $1, but I’m somewhat puzzled by this one. Something like 17 trillion of them were printed, so this may be the only one that’s actually overpriced. Quarter bins around the world are stuffed to the gills with this book. IMAGE FIRSTS WALKING DEAD #1 – This one makes a lot of sense, though. The first issue is only a few years old but incredibly expensive. Sure, it’s been collected in various types of trades (with various types of price points), but this is a great way to give someone a taste without making them dive in. And for the record, it’s an excellent zombie book.